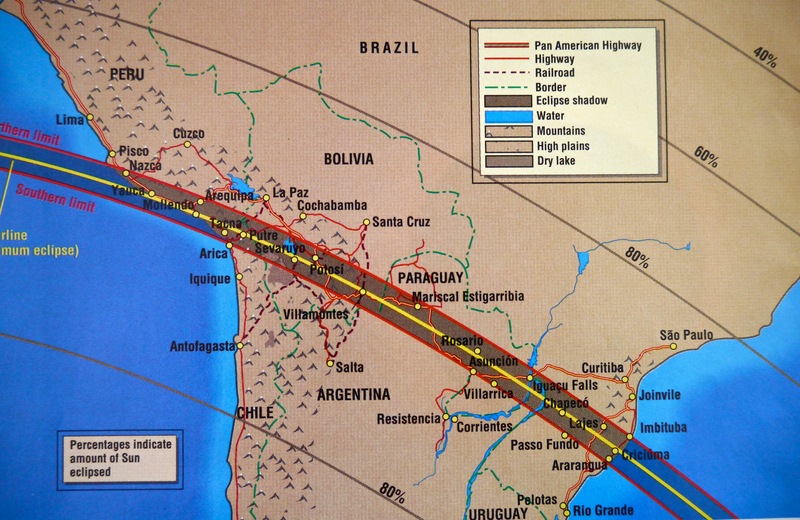 Fast forward three years, three months, and 23 days, when I join an Astronomical League tour through Spears Travel to Bolivia, “the last authentic country”. All the usual suspects were stampeding to South America, including groups with Travel Bug, Sky & Telescope, and Scientific Expeditions. 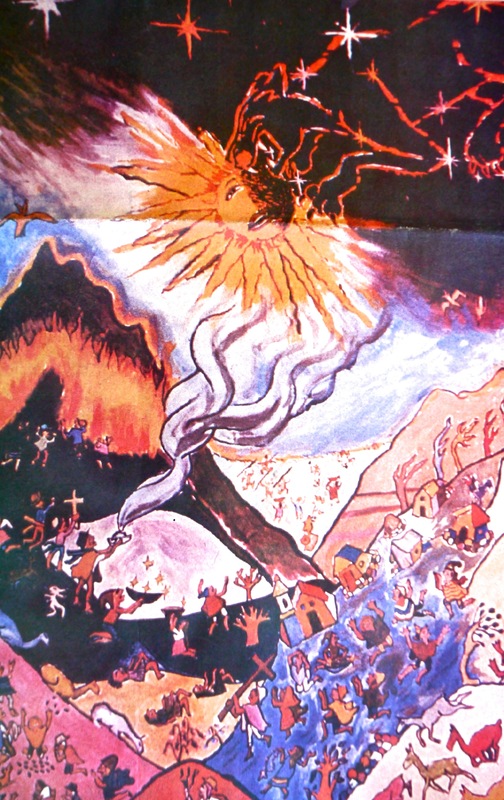 “Intijiwaña”—the Bolivian slogan for the TSE of 1994—means “Death of the Sun”, and reflects the myth imagery and extreme behavior of the average pre-Colombian Andean (who also enjoyed savage games involving decapitation). It was a puma spirit that was once believed to cause all the trouble by swallowing the sun, who must be chased away by screaming children brandishing sticks and beating other animals. (Like a dog who is reinforced to bark at the mailman because the mailman always leaves after a couple of minutes, the Andeans learned that this technique is 100% successful.) 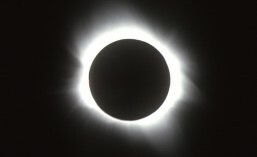 In some areas the eclipsing sun was thought to be languishing near death, and native peoples lit wildfires to warm the Earth while the sun was on sick leave. CALM DOWN Bolivia. 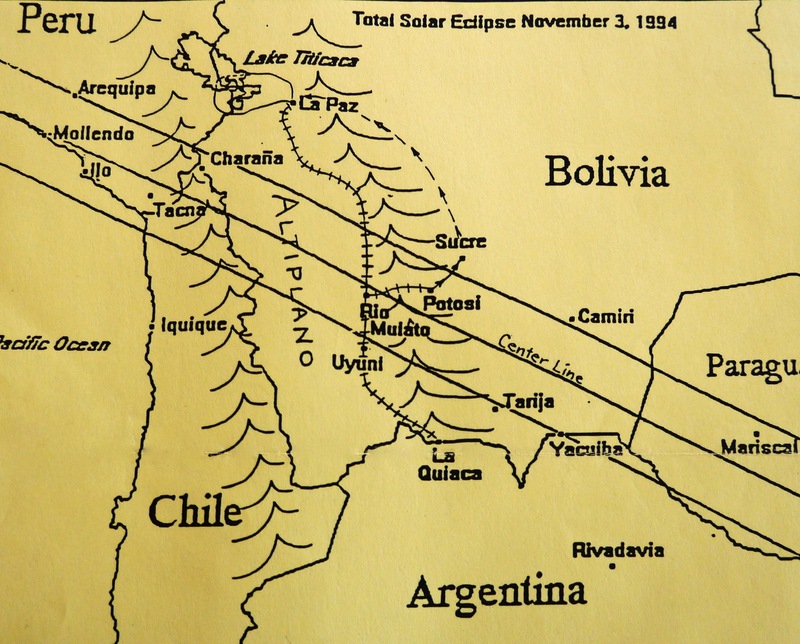 This entry was posted in Solar Eclipse Travel and tagged Bolivia, eclipse, eclipse art, Inti Jiwana, Mythology, solar eclipse, total eclipse, total solar eclipse, TSE, TSE1994. Bookmark the permalink.